Russia’s meteorological service says the 50-day heat wave in Central Russia was the worst weather-caused natural disaster in the northern hemisphere in 2010. On average, the year was the hottest since at least 1891, when records were first kept. The year was the temperature pinnacle of the hottest decade in 120 years. However the temperature growth rate appears to be slowing, with the second half of the decade just 0.02 degrees Celsius warmer than the fist half. May, June, July, August and November were the record-warm months of the year. In some cases the average temperatures were more than 5 degrees Celsius higher than the norm. The biggest disaster caused by anomalous weather in northern hemisphere was the heat wave, which struck Central Russia last summer. 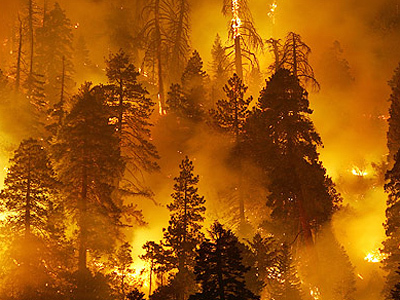 It caused mass wildfires and a surge in the death rate, as well as damage to property and the environment. Another notable disaster in 2010 was the flood in Pakistan, worst in 80 years, which took thousands of lives. Western Africa, Thailand, South America, Caribbean islands and the Balkans suffered from heavy rains and consequent disease outbreaks. Some regions of North America and continental Europe were also hit by powerful storms.